The leader of an Iranian-backed Iraqi militia group has warned that his forces are ready to fight American troops in Syria, Arab media reported. Akram al-Kaabi, the secretary-general of Harakat al-Nujaba, made the comments in response to President Donald Trump’s announcement about imminent missile strikes to punish the regime of Bashar al-Assad for the latest chemical attack in Homs Governorate. Kaabi lashed out at Trump’s remarks on Syria and accused the US president of trying to undo the recent gains of the Assad regime and its allies. “After defeating terrorism in Iraq and Syria and exposing the evil coalition led by the United States… we find that Trump is trying to make up for their defeated projects and directly protect terrorism after the attacks by the Zionist entity on Syria,” the militia leader said in a statement. “We are waiting for you in Syria,” Kaabi warned the American president. “We will resist you and defeat you just like the way we defeated your terrorism in the shape of ISIS and al-Nusra and other Takfiri groups,” he warned. Comment: As the war against ISIS reaches its twilight, Iran’s militia allies in Syria and Iraq have dialed up their hostile rhetoric against American presence in the region. 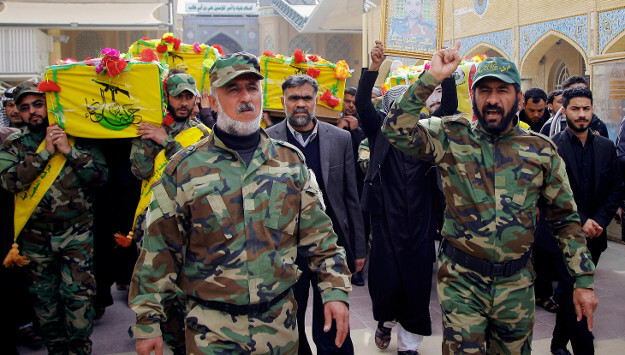 Tehran-sponsored groups – such as Harakat al-Nujaba, Asa’ib Ahl al-Haq, the Iraqi Hezbollah and the Afghan Fatemiyoun Division – have lately threatened violence against US troops in Iraq and Syria. Harakat al-Nujaba – also known as Harakat Hezbollah al-Nujaba – is a militia unit within the Iraqi Popular Mobilization Forces. The group operates both in Syria and Iraq under the leadership of Qassem Soleimani, the head of the IRGC Quds Force. Kaabi makes no secret of his allegiance to Iran’s Supreme Leader Ali Khamenei or his close relationship with Soleimani. The militia commander once famously stated that his forces would topple the Baghdad government if ordered by Khamenei. The Nujaba group has lately been threatening US forces in the region. After Trump recognized Jerusalem as Israeli capital, the Nujaba said American troops in the region were now “legitimate” targets. “Trump’s foolish decision to make Jerusalem the Zionist capital will spark a major uprising to excise this entity (Israel) from the body of the Islamic nation, and is a legitimate justification to target American troops,” said Akram al-Kaabi, the group’s leader, according to a statement published on Nujaba’s website. The recent escalation in anti-American statements by the IRGC and its proxies suggest that the Iranian-backed militia forces in Iraq are now focusing on “expelling” forces from the region now that the Islamic State – the common enemy of Tehran and Washington – is now militarily defeated. The IRGC may also be trying to send a message to the Trump administration that it will retaliate through its regional proxies if Washington pursued a more aggressive policy vis-à-vis Tehran. At least seven Iranian military personnel were killed in the latest suspected Israeli attack against Syria’s T-4 air base– further heightening tension in the volatile region and increasing the potential for an Iranian-Israeli showdown in Syria.